Smart travel tips and the best accommodation options in Kuala Lumpur are listed as well as the best restaurants, popular landmarks and shopping spots. There is a city on the horizon. You just see the gleams of it but you cannot see the place. It remains as a mystery though tempting, like all the other mysteries. This tempting mystery is Kuala Lumpur. It connects not only the rivers Gombak and Klank but also different religions and cultures. It is home to Malay, Indian, Chinese and Muslim cultures thanks to 40000 years of heritage of Malaysia. With the temples at one side and mosques on the other, Kuala Lumpur is a shelter for everyone. Kuala Lumpur, generally abbreviated as KL, is also famous for being a city of nature parks, beautiful birds, and colorful butterflies. With the tropic fruits, nicely smelling flowers and fabulous birds and butterflies, KL is like a carbon copy of heaven. Weather can be surprising in KL. Owing to the tropical rainforest climate, the rain can come up anytime to refresh you despite of the hot and humid weather. The most crowded city of Malaysia, KL is a cosmopolitan city especially with Chinese, Indian, Malaysian population. Therefore, from cuisine to architecture, everything is under the effect of this perfect mixture and this makes Kuala Lumpur a very rich city in all respects. If you are ready to discover this gleaming star of Asia, this fascinating city cannot wait to show its merits. Being the capital and the most populous city of Malaysia, Kuala Lumpur is situated on the west coast of Peninsular Malaysia. In Kuala Lumpur, there are two international airports. Sultan Abdul Azziz Shah Airport is located 20 km (12.4 miles) away from the city center. The other option is Kuala Lumpur International Airport that is located 60 km (37 miles) away from the center of Kuala Lumpur. For the transportation options from airport to the city center or your directly to your hotel, you can visit the official website of Kuala Lumpur International Airport here. Petronas Towers is the symbol not only of Kuala Lumpur but also of Malaysia. Having 452 meters height, it is the tallest twin buildings in the world. The buildings are connected to each other with a bridge on which you can admire the beautiful Kuala Lumpur view at 170 meters above ground. Located in Lake Gardens area, Butterfly Park is a popular nature park in the city sheltering 5000 butterflies, plants, insects and turtles. Also, inside there is a museum of butterflies and insects from all around the world. Merdeka Square is the symbol of the independence of Malaysia because this square is known for being the place where Union flag was lowered and Malayan flag was raised in 1957. From around this square, you can see the unique architecture of Malaysia which is a composition of English, Indian and Mongolian architecture. Being the best place in Kuala Lumpur that exhibits the historical and rich heritage of Malaysia, National Museum is one of the most popular tourist attraction in the city. KL City Gallery is located in Merdeka Square. Offering a lot of things about the city of Kuala Lumpur, KL City Gallery is mostly popular with its Newseum, ARCH work shop and the miniature model of Merdeka Square. Kuala Lumpur offers many shopping options at low-cost prices. Taking a big luggage with you will be advantageous. This area is one of the most popular shopping centers in the city. The biggest shopping malls are also located in this area. For there are many Chinese people living in Kuala Lumpur, Chinese products can be found everywhere in Kuala Lumpur. Chinatown offers the richest diversity of Chinese products. Tin products are highly popular in KL. For the best souvenirs, you can visit Pewterware and buy mugs, coffee sets or chalices. Being a Muslim country does not hinder this city from a colorful nightlife. If you are looking for the best places where you can have a great time, almost each of them are located in the areas below. Under a glamorous ambiance, Cilantro offers French cuisine with the touches of the Far East cuisines. Located in Marriott Hotel, Shanghai will be your favorite if you are into Chinese and Malaysian cuisine. The desserts are also remarkable. With the beautiful gardens and central location, Fukuya is a haunt for both dinner and lunch. You will have the chance to taste the best samples of Japanese cuisine. Malacca is located nearly 140 km away from KL. It is known for being the oldest port in Malaysia. For witnessing the deep history of Malaysia, Malacca may be a perfect option. If you are into Taoism and Buddhism Batu Caves will attract you most. Being only 13 km away from KL, Batu Caves is worth seeing with its caves, the temples in these caves and magnificent Lord Murugan statue. 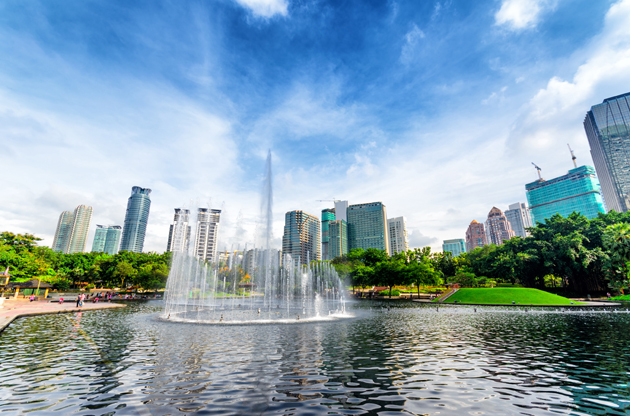 Thanks to its location and being in a fast growing economic country, KL is a very advantageous city in terms of hosting international events like fairs, exhibitions and conferences. Having multicultural diversity and modern venues and hotels equipped with the latest technologies, Kuala Lumpur is a highly preferred host city for even large scale events for years. Congresses, conferences, fairs and exhibitions in Kuala Lumpur is so popular that meeting sector comes in the first ranks in Kuala Lumpur’s tourism income.